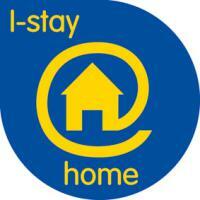 Habinteg represented the UK in the European research project Istay@home, which examined the potential of ICT (Information and Communications Technology) solutions in supporting older and disabled people to live independently. The aim of the project was to identify, select, and test a range of affordable ICT solutions that can assist older people to continue living independently in their own homes. Habinteg’s involvement in the project meant that younger disabled people are also included in solution testing. 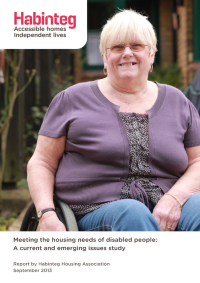 This report provides a comprehensive overview and analysis of the legislative developments and practice material relevant to meeting the housing needs of disabled people. It is based on the findings of a study commissioned from Habinteg by a group of English local authorities in early 2013. The Thomas Pocklington Trust, a leading provider of housing, care and support services for people with sight loss in the UK, has commissioned Habinteg to produce a comparative review of housing design for people with dementia and sight loss. 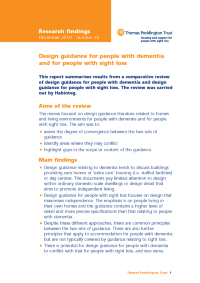 This short study will compare and contrast design guidance relating to dementia and sight loss, in order to identify elements that benefit people with dementia and sight loss, as well as key areas where design solutions for one group may adversely affect the other. The sources for the review will include Housing for People with Sight Loss, a design guide produced by Habinteg and the Pocklington Trust in 2008. Habinteg participated in a Europe-wide study into the rights and free movement of disabled people within Europe (the LivingAll project). We are the only organisation within the UK who received this invitation. 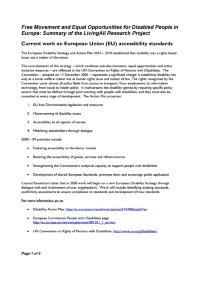 A total of ten other organisations across Europe took part including the Society of Social and Health Care in Spain, the National Association for the Accommodation of Disabled People in Belgium, the Vienna University of Technology in Austria, and the Urban Planning Institute in the Republic of Slovenia. Habinteg, commissioned by Thomas Pocklington Trust, has written a design guide for developing housing for people with sight loss. The guide details over a hundred ways that good housing design can improve the lives of people with sight loss. It is the first comprehensive guidance that draws on extensive research with visually impaired people.